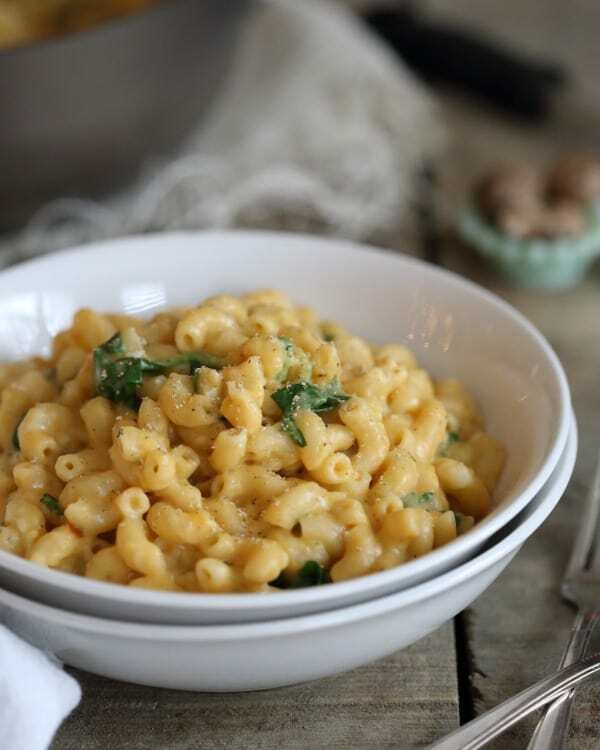 This super creamy sweet potato mac and cheese uses pureed sweet potato, almond milk and two different kinds of cheese. It’s indulgent while being a little healthier for you and sneaking in some spinach! 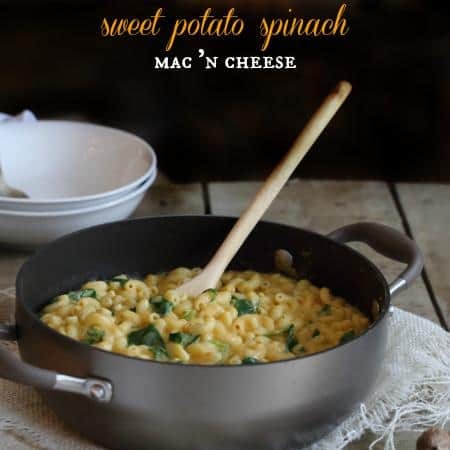 *This post has been updated to include a video on how to make Sweet Potato Mac ‘n Cheese with Spinach. Scroll down to watch! Years ago, I was addicted to 30 minute meals, like the Rachael Ray tv show, not actually cooking them or anything. I can remember the retro studio kitchen she taped all the episodes in down to every dumb this-is-clearly-not-a-real-kitchen detail. The microwave in particular really bothered me and I’ve never been a fan of retro design so I’m honestly not sure how or why I continued to watch the show for the three long years I did. One of the many Rachael-isms besides the classic “evoo” and “a dab will do ya” was the “hmmm what is that?” phrase she’d say when adding a “weird” ingredient to a pretty basic dish to describe someone’s reaction when tasting it. I’ll admit, I’ve made that spinach dish countless times adding the nutmeg and while it definitely doesn’t make me say “hmmm, what is that?” because 1. I added it and 2. nutmeg has a pretty distinct, identifiable flavor, I do adore it combined with spinach. It’s the perfect thing to get the otherwise boring spinach to pop. So, in a nod to Grenada, the nutmeg capital of the world that I just spent two weeks in, eating nutmeg in pretty much 95% of the food and drinks I consumed, I added nutmeg to this sweet potato mac and cheese. I feel like Rachael would be proud. The creaminess factor in this sweet potato mac and cheese is threefold: sweet potato puree, two different kinds of cheeses and Silk Unsweetened Original Almondmilk. 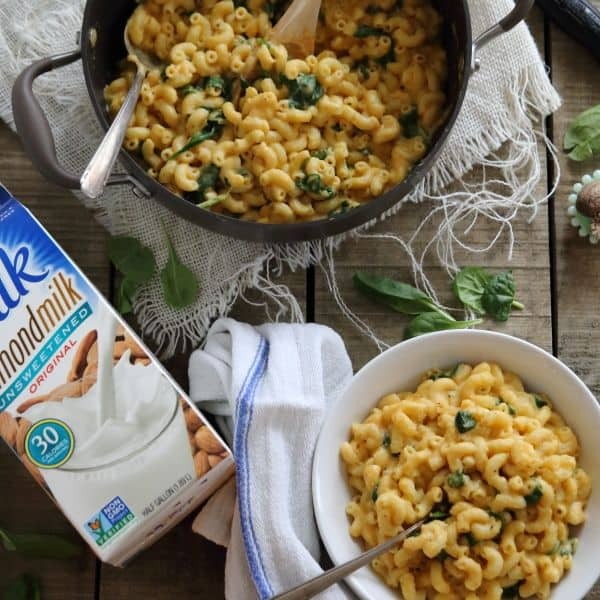 With the sweet potato, spinach and almond milk, it’s practically health food too. Don’t be fooled into thinking mac and cheese needs copious amounts of butter, flour and whole milk to be creamy and decadent. This proves quite the opposite. And who would’ve thought a tv show from 10+ years ago would be to thank for the inspiration? Check out –> Creamy Greek yogurt mac and cheese with peas and bacon or this turkey skillet mac and cheese for more health(ier) inspired mac and cheese dishes! 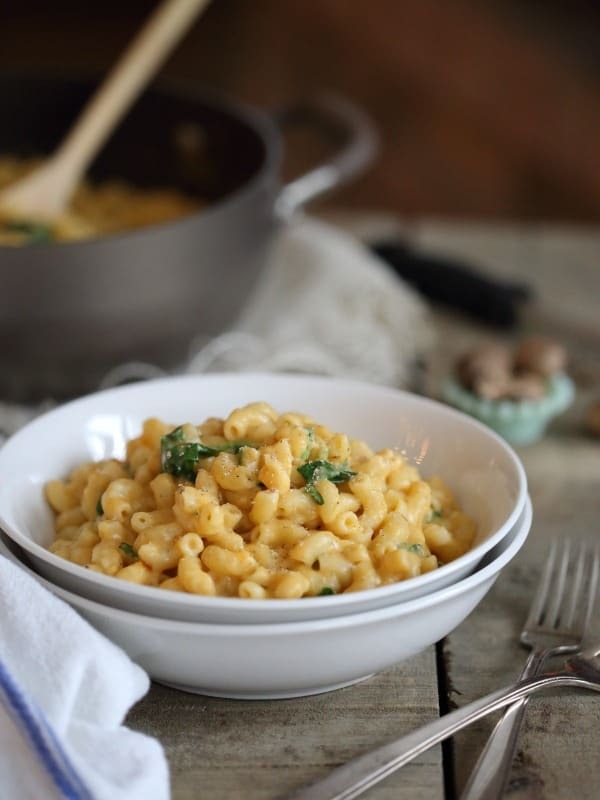 This super creamy mac and cheese uses pureed sweet potato, almond milk and two different kinds of cheese. It's indulgent while being a little healthier for you. Place the potatoes in a small sauce pot and cover with water. Bring to a boil and simmer until fork tender, about 10 minutes. Drain, place the potatoes in a food processor with 1/4 cup of the almond milk and process until smooth. Transfer to a bowl and set aside. Once boiling, add the pasta and cook according to package directions until al dente. Meanwhile, over medium heat, melt the butter with the garlic and red peppper flakes in another large pot. Once melted, add the flour, stir and cook for about 1 minute. Add the remaining almond milk and whisk continuously until thickened, about 3-4 minutes. Add the sweet potato puree to the milk and stir until combined. Add the nutmeg and salt and pepper to taste. Stir in the cheese and spinach until the cheese melts and the spinach wilts. Drain the pasta and transfer it to the pot with the cheese mixture. Stir until fully coated and serve immediately. oH my, this sounds amazing! Everything I love packed together in one comfort food! I am pinning this right now! This just brought so many memories back and mostly her stupid humor all while wondering if that dish is truly 30 mins…she doesn’t account for running around the kitchen while having 4 pots going at the same time. And the disaster you are left with after getting your dish thrown on a plate in 30 mins! Haha so true. Her “30 minute meals” were NEVER 30 minutes! This mac & cheese looks wonderful. I haven’t tried sweet potato in it before but that is a great idea! I’m in Cambodia at the moment without a kitchen. But the day I return I am making this… Sleep, then this. It sounds great! 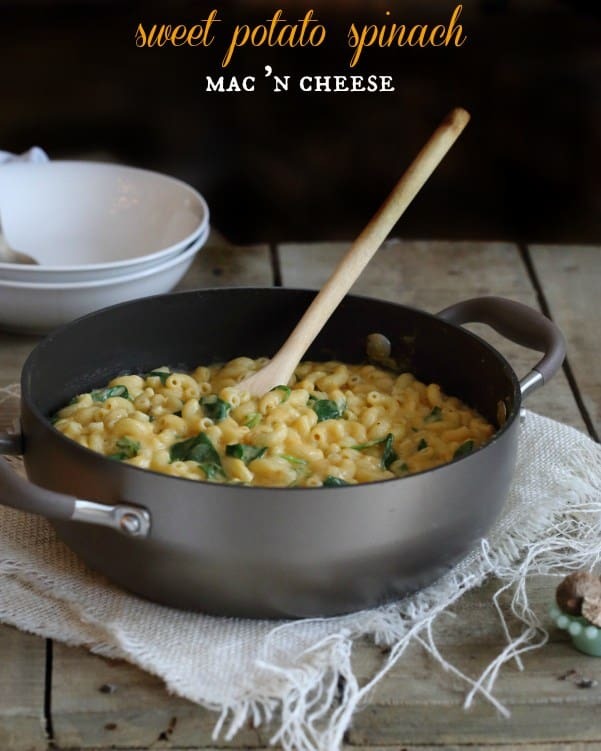 I am seriously craving mac and cheese right now after seeing this delicious post. Pinned! I’ve had this recipe saved for months and finally made it. Nothing weird about the nutmeg. But I was disappointed in the sauce. I am not amazing at sauces but I had to stir my butter,seasoning, flour, and almond milk mixture for quite a while and it thickened very little. I was honestly tempted to sub regular milk because I’m not really avoiding it for any reason. I wonder if it would make a difference. But anyway the sweet potato is genius. It turned out really very tasty but I can’t but help wonder if I messed up the sauce.